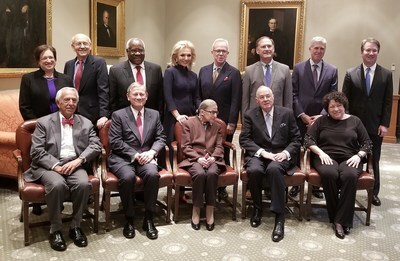 WASHINGTON, Nov. 8, 2018 /PRNewswire/ -- On the historic occasion of ten Supreme Court Justices in attendance, Judge Charles R. Breyer of the United States District Court, Northern District of California, was awarded the prestigious 34th Annual Devitt Award last night at the Supreme Court of the United States in the nation's capital. The entire Court, plus newly retired Justice Anthony M. Kennedy, and 100 invited guests were hosted by Julie C. Opperman, chairman of the Dwight D. Opperman Foundation. The Devitt Award honors an Article III judge who has made extraordinary and exemplary contributions to the administration of justice, the advancement of the rule of law and the improvement of society as a whole. The private ceremony was opened by Chief Justice John G. Roberts, Jr. who said that, "Judge Breyer represent the finest qualities of the Article III judiciary, serving our courts with extraordinary dedication and distinction." Speakers included Julie C. Opperman, Justice Anthony M. Kennedy, Judge Vince Chhabria, United States District Judge for the Northern District of California, Judge Patti B. Saris, United States District Judge for the District of Massachusetts, James Duff, Director of the Administrative Office of the United States Courts and Robert R. Newlen, Executive Director of the Dwight D. Opperman Foundation. The hour-long ceremony was followed by a reception and elegant dinner in the East and West Conference rooms. Among the country's 870 Article III federal judges, Judge Breyer has earned a national reputation as a judge who is deeply dedicated to, and effective in, improving our nation's system of justice. While advancing these broader goals, he continues to serve his own court and community with boundless energy. Judge Breyer does not merely care about humanity, he cares about human beings. Whether its case-management advice, guidance on how to deal with a high profile trial, tips on sentencing or taking guilty pleas, or just plain career advice, Judge Breyer is always willing to pause from his many important projects to help his colleagues and others in the legal community.